Foremost: fume hood fires must be extinguished promptly, failure to do so could result in loss of life and valuable equipment & processes. In case of a fire inside of a fume hood, 1. Lower the sash into the closed position. 2. Pull the manual front mount discharge cable to activate the fire extinguisher. 3. 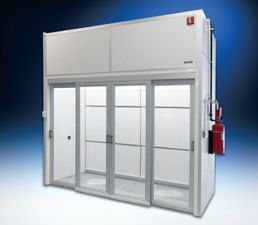 Shut off the fume hood blower on the fume hood, and any remote exhaust blowers that are connected. 4. Shut off any utility services that could feed a fire. Fire extinguisher activation occurs at 165° Fahrenheit. These are recommendations, contact your laboratory safety officer for guidelines. 1. Fire Extinguisher with automatic activation at 165° Fahrenheit. 2. Fire Extinguisher with automatic activation at 165° Fahrenheit. 3. Fire Extinguisher with automatic activation at 165° Fahrenheit. 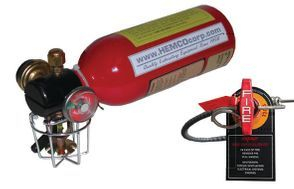 Manual discharge cable kit Note: Larger hoods may require (2) or more extinguishers, based on interior cubic dimensions.